Less than a decade ago, the only way that residents of Yekaterinburg could fly to the Czech Republic or the Greek islands was routing via Moscow. But today the new, modern, international terminal Koltsovo has direct flights to a wide range of world destinations. The whole situation began changing in the mid-2000s, when Russian private capital investors began taking an interest in the country’s transport infrastructure. That activity is now gaining impetus. The Russian government alone has pledged to invest approximately $5.7 billion over the next three years in airport development. Private investors have promised to invest an equivalent sum. The huge majority of transport movements in Russia are now made using foreign-manufactured aircraft, and passenger traffic accounts for 89 percent of this business. According to figures from the Ministry of Transport, the Russian government is preparing to spend approximately $5.7 billion dollars on airport infrastructure between 2013 and 2015. By comparison, expenditure on comparable projects for the entire preceding decade was just $4.6 billion dollars, with the bulk of the cash going towards fixing up Moscow’s airports. In Moscow, six runways were entirely rebuilt. Nowadays policy at the Ministry of Transport has altered. From 2013 onwards, regional airports will be the priority area for capital investment. “We used to have around 1,300 airports in Russia, whereas today only around a quarter of these are operational. It’s our job to turn this around,” says Maxim Sokolov, minister of transport for the Russian Federation. Of Russia’s 315 airports, 64 require urgent rebuilding. Nearly half of these are located in areas where no other feasible transport alternatives to air travel exist. Private investors aren’t looking for that kind of project. Evgeny Chudnovsky of investment company Renova notes that private companies aren’t interested in looking at airports serving fewer than one million passengers a year. However, the government hopes that its cash injection into regional airports will help to promote private investment. There are currently four major holding companies forming in the airport sphere: Renova, owned by Viktor Vekselberg, and known as Airports In The Regions; Bazel Aero, a part of Oleg Deripaska’s Bazel corporation; Novaport, which has come out of Roman Trotsenko’s AEON Corporation; and Sidinka Holdings, which is controlled by Arsen Kanokov, the President of the Kabardino-Balkaria Russian Republic. Together, these holding companies control 17 of Russia’s most important regional airports. Just like the government, the airport holding corporations are interested in one primary aim – the decentralisation of passenger air traffic. Where regional airports previously served flights from Moscow, as well as charter flights to Turkey and Egypt, inter-regional and international flights are emerging. In the near future, many of these independent airports will become fully fledged nodal hubs. Yekaterinburg’s Koltsovo airport, part of the Airports In The Regions group, is already there, serving more than three million passengers a year. Also in this category are Novosibirsk’s Tolmachevo airport, part of the Novaport group, and Krasnodar airport (owned by the Bazel Group); each has passenger throughputs above two million a year. The nascent activity of this private business sphere has begun to attract foreign investors. Last year, the business oligarch Oleg Derispaska was able to secure the interest of one of the leading international players, Changi Airports International – as a result of which one third of the Bazelairport business, specifically Krasnodar airport, is controlled by a global company. It has invested $200 million in the Russian airport holding. And this is not the only example: The Korean Incheon International Airport Corporation purchased 10 percent of Khabarovsk airport, and is now preparing to increase its holding. 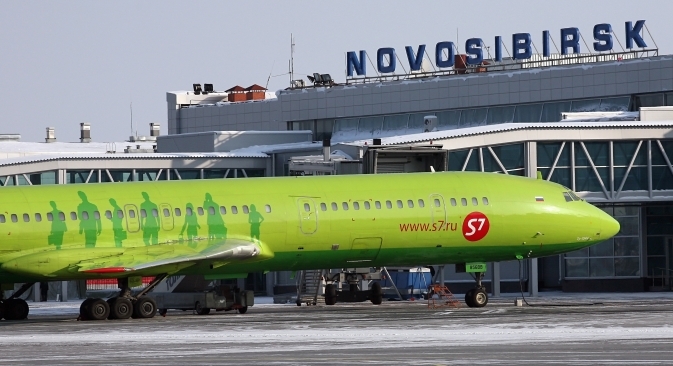 What holds back the growth of the Russian air business is a low number of air passengers. The coefficient of air mobility of Russia’s citizens is just 0.5 – in other words, out of every 100 people, only 45 have taken flights. In the U.S., the same coefficient is 2.3. High prices bear some of the responsibility. A ticket from Moscow to Yekaterinburg (about 1,000 miles) costs $306. But a ticket from Moscow to Berlin (about the same distance) is just $100 dollars if bought in Europe. “The decentralisation of transport will enable greater and greater savings to be made on costs,” says Alexei Sinitsky, chief editor of Air Travel Review.